Starting off with Read across America Day on March 2nd, the month celebrates reading, its joys, and benefits. When you read with your child or children every day you’re helping them develop the language and literacy skills that will promote future success in school and beyond. Even if your child isn’t talking yet, they’re listening and learning about their language as you read to them. Older kids also love being read to, and setting aside time to read together builds strong bonds that can last a lifetime. The month is officially marked with special events in schools, libraries, bookstores, and communities that bring authors, illustrators, and educators together with kids. I received a copy of Sunny’s Tow Truck Saves the Day! from Abrams Appleseed to check out. All opinions are my own. I’m excited to be partnering with Abrams in an Instagram giveaway of the book. See details below. Sunny’s Tow Truck Saves the Day! It’s nine o’clock in the morning and a family’s packed up a picnic lunch, clambered into their minivan, and headed out on the open road. “But halfway there…THUMP-BUMPTY…SPLAT! / What’s going on? Our tire’s flat!” No worries, they think—there’s always the spare. But when they look, they discover that tire’s flat too. They check a list of roadside helpers and pick Sunny’s Towing. They make the call and begin to wait. Image copyright Christopher Lee, 2019, text copyright Anne Marie Pace, 2019. Courtesy of Abrams Appleseed. At nine thirty the little boy hears a truck approaching. Is it Sunny? No—it’s a hauler carrying lumber. At ten o’clock the little girl spots another vehicle while her brother munches his sandwich. “Is that her truck? / Just a pickup. Out of luck.” By ten thirty the road is getting busy with construction workers making repairs and other cars traveling here and there. Over the hills black smoke from a fire billows into the sky while Dad enjoys a bite of his lunch. Mom calls Sunny, who says that she’s so busy it might be noon before she gets to them. In a moment firetrucks and police cars with their sirens blaring speed by. As time passes, they see more trucks—“Tractor trailers, rough and rumbly. / Concrete mixers, tough and tumbly. / Dump trucks filled with piles of muck. But no tow truck. We are stuck.” It’s a good time to have a snack the girl thinks. It’s getting close to noon and the family counts down the minutes. Suddenly, they see Sunny approaching. She tows them to her garage, where the tire is changed lickity-split. Finally, the family is ready to enjoy their picnic, but when they look in the cooler all the food has disappeared! Sunny has an idea. She shows the family where the best ice cream is sold, and, with cones in hand, they enjoy a perfect picnic in the park. With perky rhymes, Anne Marie Pace takes readers on a picnic that doesn’t quite come off as planned. As the family waits by the side of the road for the tow truck to arrive, the little girl and boy enthusiastically point out other vehicles passing by and take in the excitement of the construction work going on beside them. Pace’s verses shine with cleverly paired words, realistic dialog, names of various kinds of cars and trucks, and dynamic verbs that will captivate kids. Readers will love the humor sprinkled throughout that leads to the “Oh, no!” moment when the family discovers they’ve already eaten their picnic. Sunny—with an appropriately sunny personality—saves the day with her delightful desert idea. Christopher Lee lends a charming retro feel to his vivid illustrations with funky home decor, old-fashioned ads, and stylized cars and trucks. The family’s emotions are clearly evident—from their smiles as they pack their picnic to the shock of having a flat tire and finding the spare flat as well to their cheerful patience. Images of the various trucks, emergency vehicles, and other cars will thrill vehicle enthusiasts, and the two-page spread of Sunny’s garage, loaded with action and tools, will spark discussion. Humor and details abound on each page, prompting kids to linger, laugh, and learn. A sweet story that incorporates a love for vehicles, a family outing, and a fresh lesson on patience, Sunny’s Tow Truck Saves the Day! will be a favorite story time read and a fun addition to home, classroom, and public library collections. Discover more about Anne Marie Pace and her books on her website. To learn more about Christopher Lee, his books, and his art, visit his website. This giveaway is open from March 5 through March 11 and ends at 8:00 p.m. EST. A winner will be chosen on March 12. Four cars need help! 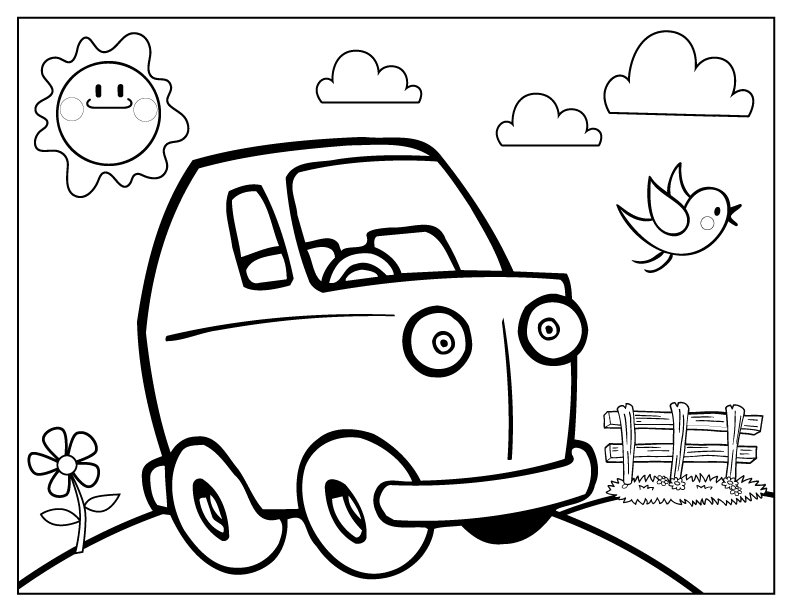 Can you show the tow truck drivers the way to the right cars in this printable puzzle? Tagged Abrams Appleseed, Anne Marie Pace, Christopher Lee, picture book review, Picture Books, Picture Books about Patience, Picture Books about Picnics, Picture Books about Seasons, Picture Books about Tow Trucks, Picture Books about Trucks, Picture Books about Vehicles, Sunny's Tow Truck Saves the Day! Today, we celebrate the maps that get us from one place to another whether it’s around town, during visits to new cities, or while crossing the country on vacation. Did you know that the first road map was designed by Scottsman John Ogliby in 1675? As “His Majesty’s Cosmographer and Geographic Printer,” Ogilby drew up the Britannia atlas that incorporated innovations in measurement that set the standard for modern maps. Instead of using the local mile, Ogilby employed the standard mile of 1,760 yards. He also created the one-inch-to-the-mile scale. Of course, nowadays maps are more likely to be accessed on your phone or in your car, but there’s still something a little magical about unfolding a paper map and unfolding an adventure! Copyright Liesbet Slegers, 2018, courtesy of Clavis. Ding! Ding! Ding! It’s the ice cream truck! Let’s go get a treat! Now it’s back into the car. “Honk! Honk!” A moving van says hi as the little one and Dad pass by. The truck is “big and long. Lots of furniture fits inside.” They also see a tanker that “carries milk from the farm to the store.” Milk! Yum! And look! A car transporter! It’s hauling five cars. Can you count them? Little ones will be captivated by Liesbet Slegers’ beautifully created Me and My Cars in which twenty-five vehicles are introduced and described with two engaging sentences that invite readers to join the child narrator in a fun learning adventure. The book is divided into three sections: vehicles for riding in, those for helping, and others for working. Slegers’ text is wonderful not only for learning about cars and trucks but for early language development as well. 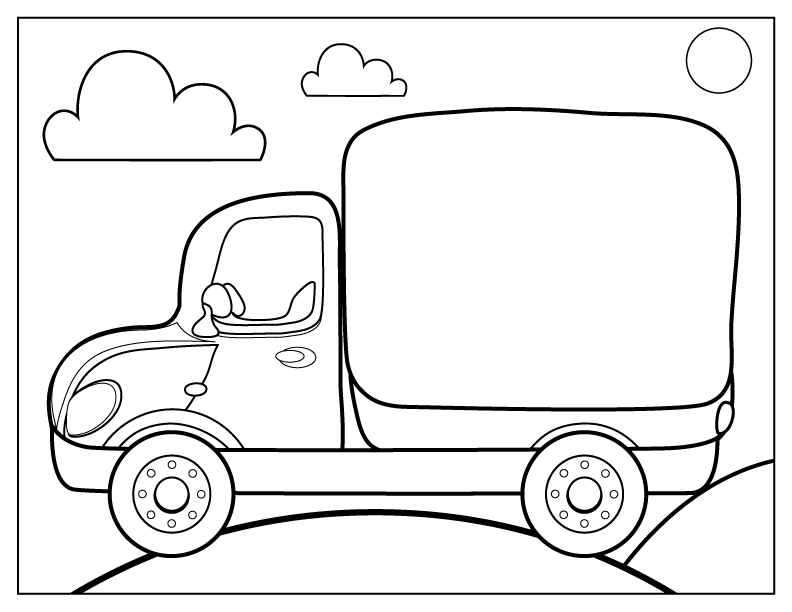 The full sentences model sentence structure important for young learners while the details of the vehicle’s uses, sounds, size, and actions teach kids new vocabulary words and give them a sense of the inside and outside of the cars and trucks presented. Each vehicle is given a boldly-colored two-page spread that first depicts the particular vehicle and then shows it and the people who drive it in action. A first choice for babies and toddlers as a gift or an addition to home, preschool, kindergarten, and daycare bookshelves, Me and My Cars is also a terrific take-along for outdoor activities and for places where waiting can be expected. Discover more about Liesbet Slegers and her books on her website. Riding in a car or truck can be an adventure! 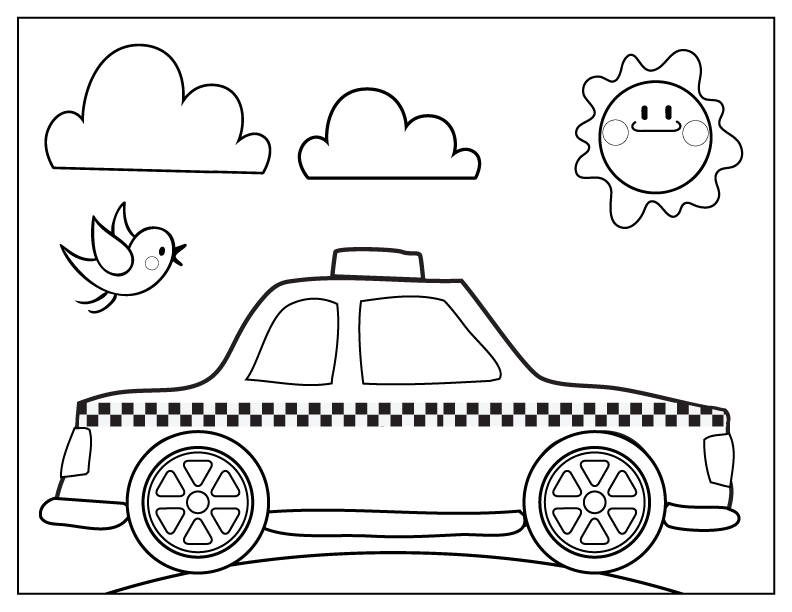 Have fun with these printable coloring pages!